Review: “Unravelling Darwin’s ‘hunch’” by Nigel Willis in the Mail and Guardian, 23 August 2017. “This beautifully written, well researched story about the origins of humans forces us to confront the social construct of ‘race’.” Click HERE to read the full review. Review: “Our Ancestors in Africa” by Steven Lang, in Grocott’s Mail, 4 August 2017. “[Darwin’s Hunch] will be a pleasure to read again and keep as a reference work to read several times over.” Click HERE to read the full review. 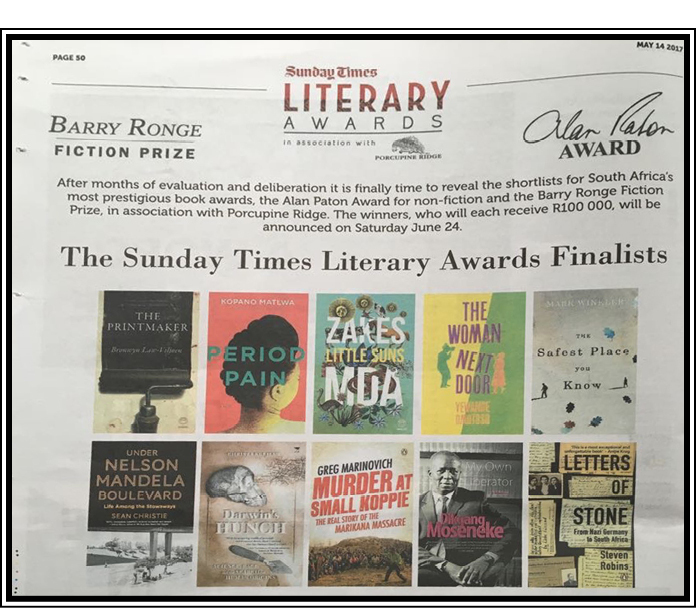 Article: “Alan Paton Awards Shortlist,” Q&A with Christa Kuljian in Sunday Times 23 May 2017. “As I began my research, I saw that the stories I was unearthing were of relevance to all of us today.” Click HERE to read the full article. Podcast: Jonathan Ancer of Amabookabooka talks to Christa Kuljian who reads an excerpt from Darwin’s Hunch 13 April 2017. Click HERE. Podcast: Tamara LePine-Williams of Classic FM 102.7 talks to Christa Kuljian, 27 January 2017. Click HERE. Review: Rehana Rossouw writes about Darwin’s Hunch in Business Day 3 January 2017. “Kuljian’s excellent book examines the search for human origins in SA and the context that tainted it.” Click HERE to read the full review. Article: “Jacket Notes” by Christa Kuljian in The Sunday Times, 13 December 2016. Click HERE to read the full article. MICHELE MAGWOOD, The Sunday Times – “With admirable fluency, Kuljian… splices in moving personal histories of the refugees: stories of brutality and suffering but also of weddings, jobs, baptisms and diplomas.” Click HERE to read Michele’s full review. ISABELLA MORRIS, The Cape Times – “Sanctuary is no dry read; it is accomplished, and also witty, sensitive, informative and extremely engaging.” Click HERE to read the full review. MATTHEW WILHELM-SOLOMON, Mail & Guardian – “Christa Kuljian’s bookSanctuary is a compelling narrative of the possibilities and limits of hospitality.” Click HERE to read the full review. SABATA-MPHO MOKAE, Diamond Fields Advertiser – “This reviewer read this book twice … the book is well-detailed and is an easy read.” Click HERE to read the full review. JOHN GARDENER, Church of the Good Shepherd – “Read this book to make you ponder on what, if any, the limits and boundaries should be to Christian charity.” Click HERE to read the full review. PAUL JEFFREY, Global Lens – “Kuljian takes us inside South African politics, both secular and ecclesiastical. It’s not always a pretty sight. Nor are there any clear heroes … The refugees in this book are real people as well, as Kuljian’s in-depth narratives reveal.” Click HERE to read the full review. BRIAN J BROWN, Methodist Recorder – “Christa Kuljian has no personal agenda, offering neither a hagiography of [Paul] Verryn nor an unblemished tribute to the Methodist Church of Southern Africa.” Click HERE to read the full review. SHANNON DE RYHOVE, from Creamer Media’s Polity, interviews Christa Kuljian about her first book Sanctuary: How an Inner City Church Spilled onto a Sidewalk, April 2013. Click HERE to watch the video.